Who else out there lovvvves Trader Joe’s?! It’s my go-to year round for fresh vegetables or when I need a quick, ready-made dinner… but in the fall, it turns into an even more magical place. Pumpkin products adorn the shelves, the scent of autumn hangs in the air, and it takes all the willpower I have not to load my cart with every single last item. I didn’t buy every fall item they had, but I did get a lot! Chris and I had a lot of fun testing out the items ever since (side note – we ate all of these over the course of two weeks lol!). Let’s start with our favorites! Like Oreos, but BETTER! These classic chocolate wafer cookies have vanilla bean cream in the middle… but the cream is dyed orange for Halloween. The cookies also have little jack-o-lantern faces carved into each one, making them super festive! 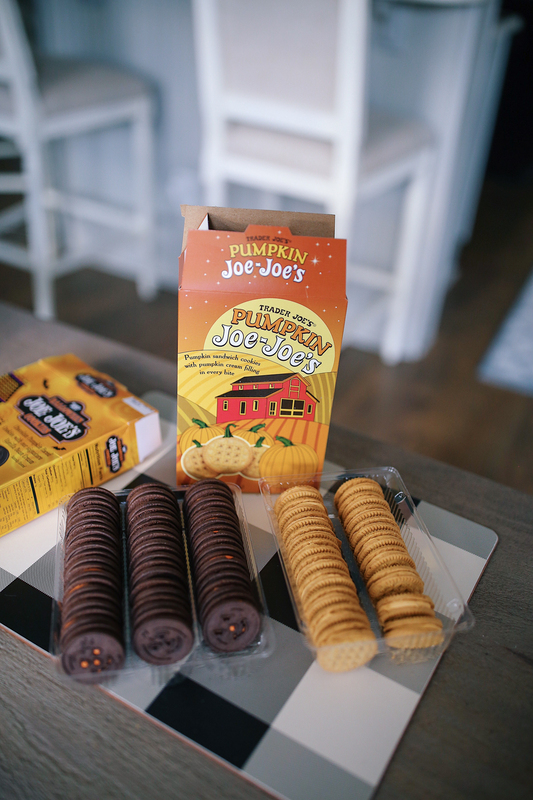 This was my first time tasting the Joe Joe’s cookies and I actually like these better than Oreo’s… and especially with a glass of milk! I felt like a little kid eating these but I didn’t care. They’re delicious! 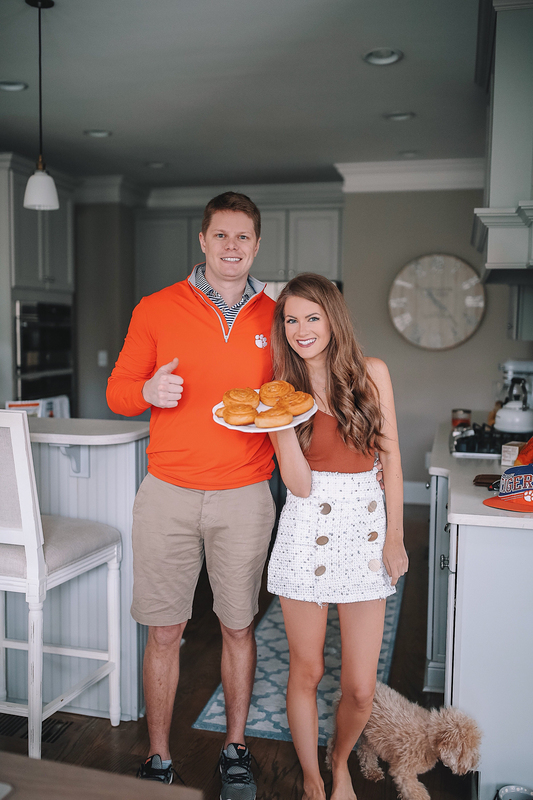 I made pumpkin rolls for my husband and brother this past Saturday before the Clemson game (hence our attire, haha). They were a hit with both boys! My husband doesn’t really like sweets (he even hates icing), but he liked these pumpkin rolls because they weren’t too sweet. I LOOOOOVED the pumpkin flavor of these, and they made our whole house smell good! I will definitely be buying them again. This candy corn popcorn is SO addicting – once you take a bite, you want another and another and another until – WHOOPS – the whole bag is gone. I will not be buying these again because I literally can’t help myself when I’m around them! They’re so so good! I don’t know if this popcorn really tastes like candy corn… but it does taste like caramel or butterscotch popcorn and who really cares, it’s absolutely freakin’ delicious. I am obsessed with drinking this herbal tea at night! It’s caffeine-free, so it’s the perfect thing to drink before bed if you want to get into the cozy fall mood. It has a pretty strong apple taste to it, which I really love! I’ve been making this tea, getting into bed and watching Halloween movies with my husband every night. We had mixed reviews on this one… One thing my husband and I agreed on was that the zuchette pasta needed to cook a tad bit longer, even though we cooked it according to the directions. So, the zuchette was a little bit chewier than we would have liked, but I personally LOVED this dish. The flavors of the autumnal harvest pasta sauce indeed provided a burst of autumnal goodness in my mouth. I ate my entire bowl so fast! My husband, however, didn’t care for the pasta sauce, which he said had a weird taste. I’m including it as a “favorite” because I love it so much, though! I made this pumpkin bread a few weeks ago, except I added chocolate chips into the mix, and WOW! It was so good! I had it every morning for breakfast with my cup of coffee until it was all gone. I didn’t realize it was gluten-free until I unpacked it from my grocery bags. It tasted like normal pumpkin bread, so I didn’t even notice that the gluten was missing, haha. I normally like making my pumpkin bread from scratch, but this is an awesome mix if you’re short on time! I was really excited when I first saw this Pumpkin Spice Almond Beverage on the shelves at Trader Joe’s… but I was pretty disappointed by it. I tried it first as a coffee creamer, thinking it would give my coffee the perfect pumpkin-y flavor, but alas, it did not. In fact, there’s a weird chemical aftertaste to it. Id’ love to know if anyone else has tried this one, and what your thoughts are! 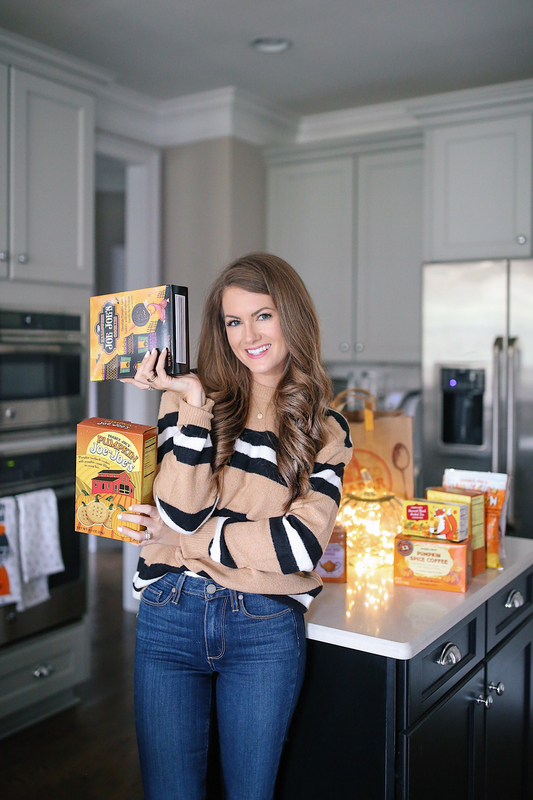 Another item I was really excited about… these pumpkin spice coffee pods intended for Keurigs! Chris and I both use our Keurig a lot during the week so we were excited to find these K-cups. However please heed my warning: DO NOT BUY THESE!!!! I tried one out over the weekend and the taste was NAUSEATING. My husband smelled it and was nauseated by it without ever even taking a sip, haha. I didn’t taste pumpkin in the slightest… more like bad, burnt chemicals. I tossed the whole box away right then and there. The pumpkin butter is really good too! I put it on the apple bread I made and it was delicious. 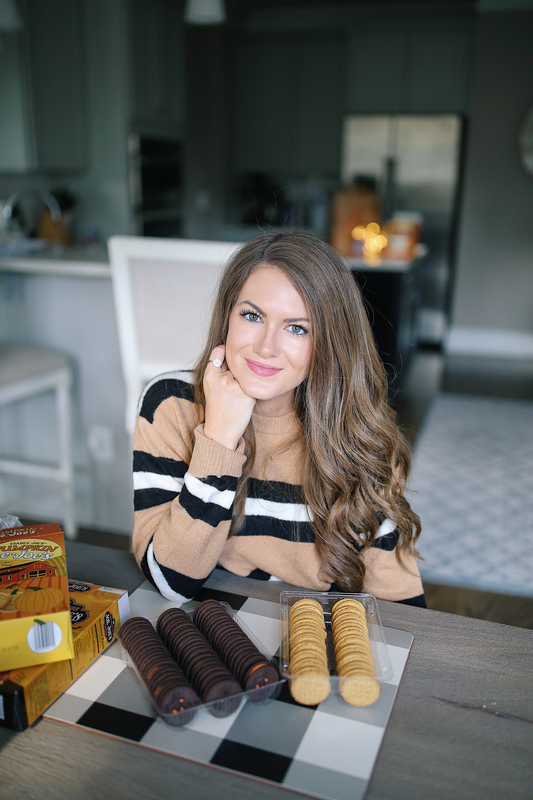 Oh my gosh, I wish we had a Trader Joes here in England – I love visiting them when I’m Stateside! Thanks for all of your reviews Cait. These sound amazing! Can’t beat some of these autumn dishes. I was excited about the almond milk creamer too! Until I read the ingredients – you’re exactly right, weird chemicals! Instead, I bought the pumpkin pie spice mix (all ingredients you’ve heard of) and sprinkle a dash in my coffee. It’s the PERFECT amount of pumpkin spice flavor! Omg some of these souns soooo delicious! Mmmhhh pumpkin bread…. 🙂 Had to lol at your ‘worst’ picks, I feel like pumpkin spice flavoured beverages are ALWAYS a strong hit or miss – mostly miss to be honest haha! The Halloween cookies look amaaaaaaaazing! I love holiday-themed food, I’m such a sucker for that stuff. OMG I agree that the pumpkin spice coffee was awful! I almost bought the almond milk and I’m so glad I didn’t. I’ll definitely try out the tea! The little pumpkins filled with cake and mousse are seriously addicting. I bought them for my kids and ended up eating a few myself. Even the cashier warned me! No way! I looooove their pumpkin spice coffee, but my mom had the same feedback you did and I thought she was crazy! OMG I totally almost bought the pumpkin spice coffee pods!! So glad I didn’t now haha. I bought a ton of pumpkin spice stuff the other day and can’t wait to dig into it all. Loved this post! Wish I would’ve read this before last night. I would’ve skipped the K-cups that I grabbed & won’t be finishing! Not all pumpkin spice is the same!! Should’ve grab the cookies at the check-out instead! Love that you’ve been including your hubby in posts & your brother is adorable!! My husband and I love Trader Joe’s. The pumpkin spice rolls are very good. Another pumpkin item is the Pumpkin cereal bars. I love the Harvest blend tea. Trader Joe’s has so much awesomeness to offer, but coffee is definitely not on that list. We have a running joke about TJ’s coffee because they bought some once and it was just nasty. Kinda like drinking a hot cup of dirt. LOL! I’m going to have to try the Pumpkin Bread mix. We have several ladies at bible study who have celiac and they will be thrilled when I show up with this. THANKS!!! The TJ iced pumpkin scone cookies are AMAZING but I haven’t found them in forever. 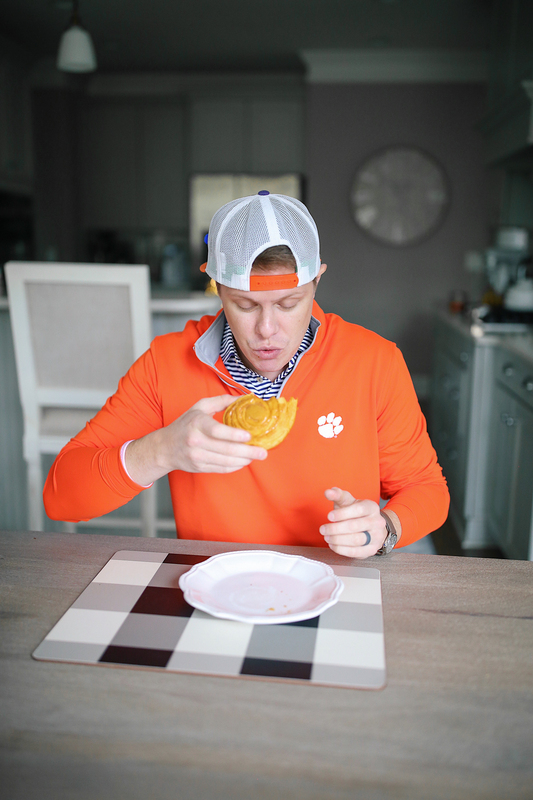 The pumpkin spice shortbread cookies are also DELISH!! I have to try those pumpkin rolls, they sound so good! I loved the pasta sauce! Another thing I’ve been loving are the frozen pumpkin waffles. I also absolutely HATED the pumpkin spice coffee and had to throw it away immediately! So gross! I thought the pumpkin rolls were amazing, too! And the caramel apple granola…so good! I totally missed the pasta sauce, but will definitely be going back for that and the tea! And more pumpkin rolls! I also tried the butternut squash mac n cheese people have raved about, but it just wasn’t my cup of tea. I have to laugh at your comments on the pumpkin spice kcups because I feel the EXACT SAME WAY! I bought them last year and they’re absolutely horrible. So. Bad. I had to throw away the box too. Anyways I loved this post, you should continue to do these with your Trader Joe’s hauls! Have a great weekend! I am in LOVE with the oreo joe-joes, the granola, and the candy corn popcorn (and I don’t even like popcorn!). I agree the pumpkin spice beverage is awful and I love all pumpkin. SOO disappointing! I may need to try that pasta and sauce! Thank you for sharing!!! The Autumnal Harvest pasta sauce is my all time favorite products at TJ’s. It’s heaven in a jar and I always make sure to stock up when fall rolls around! It’s especially delicious on their pumpkin ravioli – you should pick up some of that next time you go! The pumpkin spice almond drink was so grossssss. I got it and was excited to try to but it tastes very artificial like I’m drinking an pencil eraser. The jo jo cookies I like a lot too! I was on the fence about buying the pasta, good to hear you liked it! Ahhh thanks for the recs on not buying the pumpkin kcups…I am making a trip there today and was going to try them. Now I will just save the money, haha. You have to try the pumpkin ice cream it’s amazing!!! So creamy ! I love that harvest tea and bought some of the almond milk beverage last weekend, and now I’m scared to try it!! 🙈 I’ve heard the pumpkin spice granola bark is good, so I got some, but haven’t tried it yet. You must try the Autumnal Harvest Soup in the jar… my absolute favorite! Also, the pumpkin madelines are to die for! The Organic Pumpkin Spice Granola Bark is SO. GOOD. Highly recommend for a small, sweet snack! Hahaha I love that your picky on your coffee , yaaasss girl! Bloggers gotta be hahah. Loved this review! Love the new layout too. Very nice typography. Love this type of post! Would love to see something like this for Target finds! Obsessed with Trader Joes! Thanks for this post! I have to try some new things. Just an FYI…Trader Joe’s has an awesome return policy. If you try it and don’t like it, simply bring back whatever you have left and they’ll give you a refund. Don’t throw it away!! I ate the whole bag of the candy corn popcorn too 🤭 it really is THAT good! I loved this post! 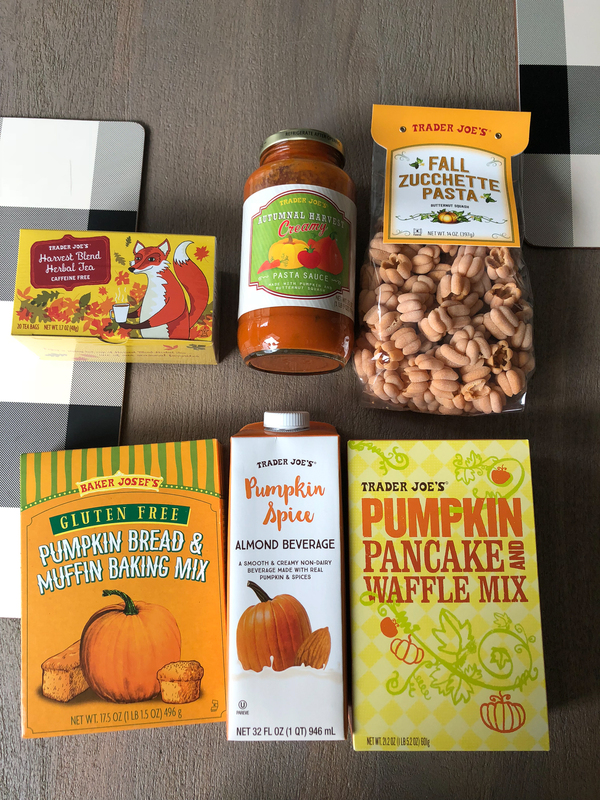 I am a trader joes fan as well and their fall section is to die for! Their pumpkin biscotti for coffee and tea is high recommendation from me. Not too sweet but not too plain for me. A bit hard to crunch on but I personally did not mind it especially if you dip it in the coffee. Also their pumpkin spice seasoning I have used to make deserts and coffees taste more according to our season. I would give those two a try for sure! I need to try the Joe Joes and that pasta sauce! Yum! I love this post! 🙂 If you can find them, try the maple leaf cookies and petite pumpkin spice yogurt cookies from Trader Joe’s! They’re both soo amazing, my fiance and I stock up on them when it’s finally Fall! I agree – the pumpkin spice k cups are horrible. The flavor is not good. I’m so glad you liked the pumpkin cookies as I just got them to try this weekend. The pumpkin spice K-Cups are okay in my opinion, but I also think I expect every pumpkin spice coffee to taste like a Starbucks PSL, so maybe my expectations are too high! I love their pecan pumpkin instant oatmeal! It’s so easy to grab on the way out the door and make at work in the morning, and it tastes so good! Just now reading this… a little late! ha! But oh my goodness, I agree about the PS almond beverage. I wanted it as creamer and ew… it was terrible! I was sad.